Amber in Magic and Medicine. Learn about amazing Baltic Amber. millions of years in fact. Many believe the theory that every Gemstone has a unique energy for something. In some instances, people believe gems can do everything from changing your future to curing your ills or warding them off at least. According to the history we have of natural Baltic Amber, the sun is believed to be a contributing factor to the power behind the stone. When the ancient forest was kissed by the energy of the sun and then shed its life force  resin  to the earth, it is believed that the resin  now what we know as Baltic Amber  was protected and enhanced. Those followers of Amber who recognized its unearthly powers held all sorts of beliefs. Amber was associated with protecting, healing, defending, and purifying and it became a sacred stone or amulet for those who traveled the seas. In fact, many believed that because Ambers power comes from the sun, it has natural protective qualities; they also believe that because it was further purified in its river and sea travels, that it keeps us safe from floods and other harmful water events. 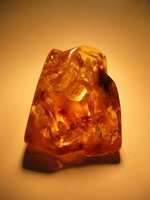 Most of all, everyone believed that Amber was a symbol of good fortune in general so it was a must have item in that day for any number of very good reasons including wellness during pregnancy and safe delivery of babies, relieving mental duress, stress, and depression, and soothing and removing physical pain of any kind. So now lets explore the power within the stone. As every Lithuanian knows, the name Amber is translated as gintaras the origin is verb "ginti"- protect, defend. Even more interesting, the natural magnetism of amber, which manifests itself if you hold a piece of Amber against fabric and then put it in proximity to other materials where it quickly attracts small pieces of them, correlates to natural electricity which comes from the Greeks and also, ironically, means amber. We also know that the key ingredient in natural Baltic Amber is Succinic Acid, one of the most powerful substances necessary to human health. While it is found very minimally in nature, Succinic Acid is the dominant factor in Baltic Amber. It is also one of the key substances found in the most expensive skin renewal and regeneration products. So all things considered, scientists are quite comfortable with the knowledge that natural Baltic Amber is very powerful and very special in its healing properties and are looking for more ways to utilize it to its full capacity. Certainly, thats a very big complement to Natural Baltic Amber but for those of us who have grown up with this amazing Fossilized Resin from an Ancient Forest, we are happy to have Amber in our ordinary everyday lives - for its power to heal, restore well being and relieve pain and stress. It is a friend that we just can do without. When presented with all of this interesting and enchanting information, one cant help but ask the question: how can we utilize the magic of natural Baltic Amber in present time and in our own lives. For those of us who have grown up with Amber, we already know some of the answers. Read more about the many healing benefits of Baltic Amber. Disclaimer: The material provided on amberartisans.com is for information and educational purposes only and is not a substitute for medical treatment or diagnosis. We assume no responsibility for treatment or cure of any illness or disease. I'm thankful that I was home today when the USPS carrier rang my door bell and asked for the required signature confirming successful package delivery. The parcel arrived in perfect condition; I thought the bow wrapped inner box was a lovely touch! The cognac Amber Bracelets and matching Amber Necklaces are beautiful and because we're having a sunny day here in Austin, Texas, I've placed all of the Amber Jewelry outside to absorb some of this marvelous sunshine; I've heard that amber is sometimes called the Tears of the Sun. Also, I find it interesting that people* who can see the human auric field, say that it's one of only a few substances that strengthens and makes brighter the subtle energy body. The 3 bonus gifts: multicolored amber ring, cognac heart pendant, raw amber. Are very much appreciated! Your account records can verify that I'm am a repeat client from the USA and have always been pleased with the quality of your jewelry products and customer service. The amber barrel-clasps on the necklaces have never broken or failed and are easy to fasten by using feel of touch alone, which is a big plus for the very elderly; while the strands of individually knotted, pebble-like, beads of polished Amber that compose the necklaces, have held firm and remained shiny and beautiful throughout years of continuous wear and are making many of my close friends very happy. I give you my permission to use any portion of this correspondence to post on your website regarding customer satisfaction feedback. I just got my sons Amber Teething Neckace today and it is beautiful! I will be recommending your business to all of my friends because not only is the quality of the product great, your communication was excellent. thanks again! I had done weeks of extensive research, and ended up ordering a total of 6 items over three separate orders. This is a family owned company with excellent customer service and workmanship. Over the 3 month period I was ordering Amber Jewelry, they continually updated their website to be more extensive and user friendly. They are flexible and communicate promptly and professionally. They also want you to know that your Baltic Amber Jewelery is authentic, so they send extra beads and explain how to test them for authenticity. They also provide extensive information about the history and uses for their product. I have truly enjoyed doing business w/them as well. They guarantee your satisfaction and accept returns and exchanges. I wish there were more small, artisan-type stores like this. I definitely recommend them for quality, customer service and overall value. I received my Amber Necklaces in about 10 working days, coming all the way from Lithuania! It's hard to get US merchandise that quick. The experience with this company was fantastic. Everything they said about their product is true. I love the necklaces...they are beautiful Amber and of great quality. I received confirmation on purchase and shipping right away and was not concerned with credit card info since they use paypal. All in all this is a great company and I will purchase from them again and again. Dear Svajunas and Amber Artisans, We received our Mom and Baby Necklace set and absolutely love them! They are gorgeous and exactly what I wanted, not to mention the fact that they have helped with teething and neck aches. I have recommended your company to all my friends--thank you so very much! I had a slightly custom request with my purchase for Mens Beaded Bracelet and they more than graciously accomodated 100%. My order came, and was perfect and absolutely gorgeous. It is clear that they took care to not only make a quality product but to also make it a personal work of art. They should be proud. I will be doing business with Amber Artisans again soon! Thank you very much! Very personable, excellent craftsmanship, I will absolutely return to Amber Artisans. The rep at "Amber Artisans" responded to my email very quickly. And I received the Amber Necklaces shortly thereafter.I knew I was ordering from a company overseas and that was my main concern that the company was legitimate.So receiving an email that quickly was comforting.Thank you. I am very pleased with our new Amber Necklaces. The craftsmanship is exceptional! The necklaces are beautiful and I feel safe with the attention to detail in the design. The clasp is easy to use and the individual stringing is peace of mind for my baby's necklace. She was cutting her two top teeth and miserable. I am not sure of the effects as of yet, since it is day two. It does take some time to recieve them as they are coming from Lithuania., so be patient.Thank you! Amber Artisans has the highest quality Baltic Amber out there. I highly recommend them. I purchased Amber from another store and was not satisfied. Amber Artisans has the nicest and best priced amber. Their quality far exceeds others and the customer service is excellent, thank you Amber Artisans for truly believing in your product and putting so much love and effort into it! This is my second order for Baltic Amber Necklaces, I gave mine away because my sister loved it. Your quality and authenticity is the best there is out there for Amber. My daughter wears her Amber Necklace every day and loves it. Thank you so much for providing such a rare, beautiful and healing necklace for us. As I mentioned to you in my email, my vitiligo is healing after wearing the Moms healing necklace for 2 weeks, it is a miracle!!! Thank you. Beautiful Mens Beaded Bracelet, fast shipping considering the great distant. Thank you! "Just wanted to let you know the Baltic Amber Teething Necklaces we received were exactly what we were hoping for. The baby has been actually sleeping through the night and the teething pain has miraculously stopped. We will not hesitate to recommend your company to our friends." "WOW!!! The Amber Bracelets looked great online, but in person they are superb! My yellow butterscotch cuff really stands out and I don't mind the attention! Thanks for your efforts in shipping so fast." Amber Artisans proudly offers Precious, Healing, One of the Kind Amber Jewelry for Women, Men and Children. Our Baltic Amber Products are made of 100% genuine Baltic Amber. Our master craftsmen employ centuries old techniques to perfect each Amber bead, each strand, each miracle of unearthed natural power into a powerful resource that can become a key resource in your life. Our natural Amber Teething Necklace can soothe teething pain for your children. You can also ease your own stress with a matching Amber Necklace or Amber Bracelet. We also invite you to explore and learn about Baltic Amber's history in the Amber Education Room. Get the real story about one of history's greatest mysteries the search for the Amber Room! It could change your life. We are a group of artists and craftspeople dedicated to bringing the highest level of craftsmanship to Amber Jewelry Making. We make everything by hand, using a combination of old world tools and techniques alongside the latest technologies. Many of our Baltic Amber Jewelry pieces incorporate techniques that we develop ourselves. Everything is handmade in our workshop by experienced Amber Artisans. We are the point of origin for all our Baltic Amber Products. We are not a reseller so there is no middle man who adds to the cost. Buy Wholesale Baltic Amber Jewelry and supplies from Amber Artisans. If you need a special size, we would be happy to make it to your specifications. If you have a special design in mind, we are glad to accommodate you! ValueCompare our prices and see! SecureSafe and secure shopping with 256bit SSL encryption. GuaranteeOrder with confidence - all purchases come with a 30 day guarantee. PrivacyWe do not sell or share your private information. Zero spam tolerance. © Amber Artisans. All Rights Reserved.